The world is experiencing problems for which they have no answers. WE are the answer. Like no other time, the Church and the Ministry can and should be out-performing the world, and at this year’s conference we’ll show you how! 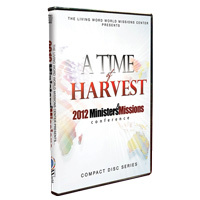 This conference compilation contains all of the revelation and anointing shared by each of the main speakers. Let the Godly wisdom contained in this special teaching series help to propel you and your ministry to a new level of empowerment as you boldly go forth to manifest the Kingdom of God as this is your Time to Harvest!